Here is another great gift idea for the grilling Dad in your life this Father's Day: The SpeedyPlus Instant Marinater from Jaccard! I love marinating meat for the grill but I hate that I never remember to do it until the last minute so the meat doesn't really marinate long enough. The SpeedyPlus Instant Marinator eliminates that issue for me and instantly marinates in only 5 minutes! LOVE THAT! The SpeedyPlus Instant Marinater from Jaccard is a multi-functional, complete grilling and marinade preparation system. It is a complete food preparation tool that instantly marinates, stores and transports the meat to and from the oven or grill. The SpeedyPlus provides commercial level vacuum pressure which causes marinades to penetrate deeply and completely into the meat in as little as 5 minutes. 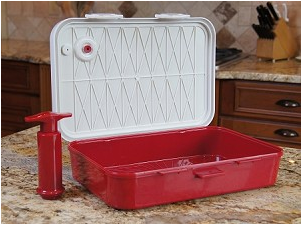 The patent pending 10" x 14" design sports a 4.5 liter volume which can accommodate up to 14 boneless chicken breasts. The marinating chamber's locking tabs secure pre-cooked juices within the container, eliminating cross contamination potential. 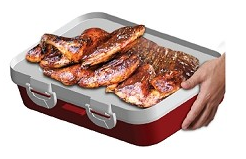 The uniquely designed "platter" cover tray integrated into the marinade chamber cover provides an ideal surface for transporting cooked foods from the grill back into the kitchen. It easily disassembles for quick and effortless cleaning -- and it is dishwasher safe. Complete BBQ preparation tool that instantly marinates, stores and transports the meat to and from the grill. Exacting manufacturing standards provide commercial level vacuum pressure which causes marinade to penetrate deeply and completely into the meat in as little as 5 minutes. 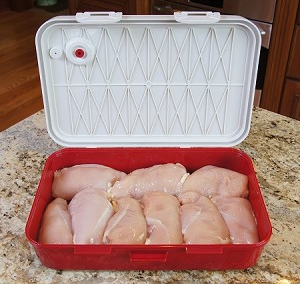 10” x 14” design provides 4.5 liter volume which can accommodate up to 14 boneless chicken breasts before, during and after marinating. Marinating chamber’s locking tabs secure pre-cooked juices / bacteria within container, eliminating cross contamination potential. Tray integrated into the marinade chamber cover provides ideal surface for transporting cooked foods from the grill back into the kitchen. Tray incorporates a spill guard rim to eliminate mess. Exclusive stability rib / hinge design eliminates tip-over potential. Dishwasher safe; easily disassembles for quick and effortless cleaning. Marinade from now on in MINUTES with The SpeedyPlus Instant Marinater!